The following series of videos shows you how to use Atmel START, the Advanced Software Framework 4 (ASF4), and the Atmel Studio IDE to develop and debug a project for the SAM L21 microcontroller. 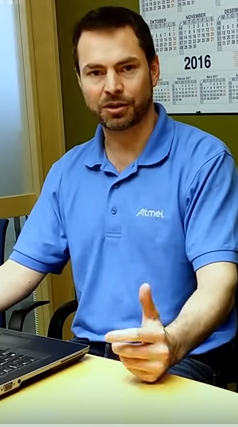 Glen also demonstrates many valuable tips and tricks for the Atmel Studio IDE. For example: Do you know what 'F1 datasheet help' is? Watch video 8 to see it in action. Create a project from scratch using the Atmel START graphical project configurator. Add a USART driver to the project. Use ASF4 example code to send a message to a serial terminal over the USART. Move USART ASF4 example code into main.c. Add and configure an ADC driver to the project. Measure the analog output from the light sensor on the I/O1 Xplained Pro board. Use an I/O view window to display the ADC Result register. Add and configure a Delay driver to start an ADC conversion. Add code to the ADC callback function for the Interrupt Service Routine (ISR). Display ADC result values on a serial terminal and graph with the Data Visualizer. Add and configure a Timer driver to start an ADC conversion. Use a SAM L21 GPIO pin to measure the ADC conversion time. Plot the conversion time in the Data Visualizer. Embedded Debugger (EDBG) GPIO pins with the Data Gateway Interface (DGI). Put SAM L21 into Sleep mode. Configure Timer and ADC to run in Sleep. Use the Data Visualizer to measure power consumption. Download the 'Low power' example project from Atmel START and import it into Atmel Studio. The Data Visualizer is used to display the power consumption. The USART is used to temporarily wake the SAML21 from sleep. A low power SleepWalking project is also demonstrated. Use a watch window to view temperature sensor data. Add and configure an SPI driver for the data stream module in the Data Visualizer. Embedded Debugger (EDBG) SPI pins with the Data Gateway Interface (DGI). Add SPI initialization example code. Add example code to implement the data streamer protocol. Use the data stream module to send temperature and light sensor measurements to the Data Visualizer. Use Advanced Software Framework 4 (ASF4) example code to send a message to a serial terminal over the USART.